Despite the earlier reports today, Pat Burns is still alive to continue his fight with lung cancer. Pat is a household name in Canada, and in the New England area, where he coached the Devils and the Bruins. Pat is best known professionally for winning the Jack Adams trophy as the coach of the year in the NHL three times, and coaching the New Jersey Devils to the Stanley Cup Championship in the 2003-2004 season. 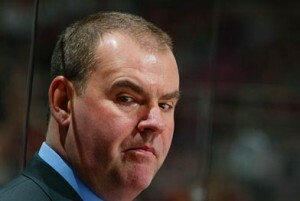 He is famous for his intensity and fiery Irish manner behind the bench and during interviews when he was coaching. He is also famous for his class and composure while dealing with cancer. Pat was diagnosed with colon cancer in 2004. He announced he would fight the battle in the same typical style that he would face the challenge of his next opponent. He and his doctors were successful in stopping the colon cancer, but the cancer returned in 2005 in the form of liver cancer. Again, Pat fought the good fight and got rid of the liver cancer, which is not an easy thing to do. In 2009, Pat was once again diagnosed with cancer, and this time, it is in his lungs. I have never had the opportunity to meet Pat Burns, or the privilege of speaking with him. However, I have spoken to a lot of cancer patients over the years. If you have ever spoken to a cancer survivors, it comes as no surprise that Pat declined chemotherapy this time around. Almost anyone that has endured chemotherapy will tell you that they will never do it again. I can only speculate, but I believe Pat might be cancer free it he had started eating an alkaline diet and drinking alkaline water when he was first diagnosed with cancer in 2004. Cancer can’t survive in an alkaline state, and if you eat an alkaline diet and drink alkaline water, your body will become alkaline, the way nature intended. Given that Pat had cancer three different times dating back to 2004, I expect that his body has remained in an acidic state the entire time. If anyone that reads this article knows Pat, or is in contact with him, please direct him to this blog. I would be delighted to speak to him. I might not be able to convince him to eat an alkaline diet and drink alkaline water, but I would certainly make him aware of how the water has helped so many others with cancer. This article is not meant as medical advice. Anyone with health issues should always consult their health care provider.